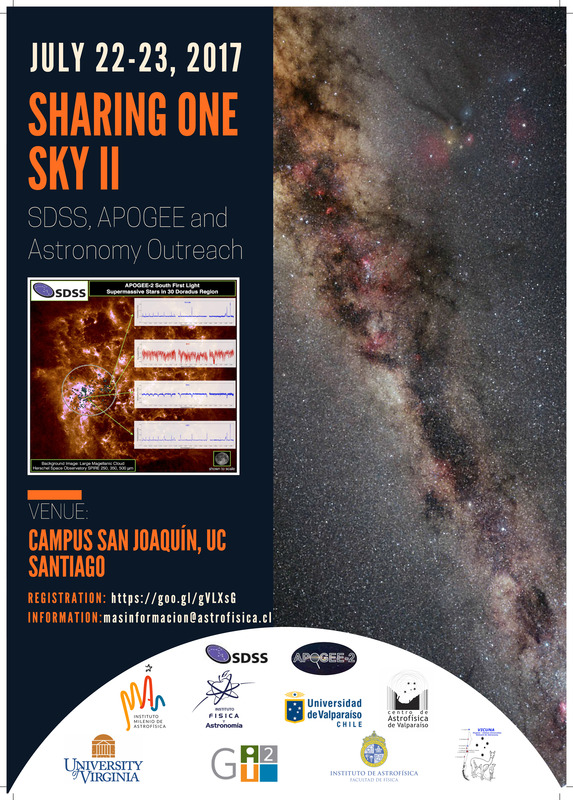 We are pleased to announce the second SDSS/APOGEE Workshop on Outreach and Education, which will take place at the PUC, Santiago, Chile, on July 22-23, 2017. The focus of the workshop is astronomy education and public outreach, with a particular focus on sharing strategies and methods, creating cross-cultural and multi-lingual ventures, forming E/PO collaborations, and exploiting the science and international reach of the Sloan Digital Sky Survey (SDSS) and the Apache Point Observatory Galactic Evolution Experiment (APOGEE) — which is operating from parallel sites in the U.S. and Chile — for fostering these activities. We wish to bring together astronomers, educators, and journalists to achieve the above objectives, and also formulate methods by which we can promote the public face of SDSS and APOGEE within Chile, across the Americas and beyond. The conference will be located in Campus San Joaquin of Universidad Catolica, Santiago, Chile. Attendees are responsible for making their own hotel reservations in Santiago. For more information please visit the official WEB page of SDSS-IV Collaboration Meeting Santiago 2017. Attendees should also please register for the workshop on the registration form https://goo.gl/gVLXsG not later than 22.06.2017, or cut/paste the information below and emailing to Natalia Atencio natencio@astrofisica.cl (with a copy to jura.borissova@uv.cl). If you are not SDSS member are you interested to participate in Monday morning plenaries of SDSS-IV Collaboration Meeting (yes/no)? Sponsors: A workshop is funded by Millennium Institute of Astrophysics (MAS), Universidad de Valparaiso, Pontificia Universidad Catolica, and Center for Global Inquiry + Innovation in partnership with the Vice President for Research and the Dean of the College of Arts and Sciences at the University of Virginia.